The roads in Charlotte were not friendly this morning. Riding back alone from my very early morning group ride there were multiple incidents of drivers coming too close to me, two of which were either intentionally mean or extremely reckless. In the first, I came to the bottom of a hill on Sharonview Rd. in Charlotte. I stopped at the red light, looked left and waited for cars to pass. I could see at least a quarter of a mile down Colony Road and it was empty. I started right. Suddenly I felt that brush on my legs of a car not quite touching but very close, as a black Scion came from behind me, passing me in the turn, in my lane. The fact that he didn’t bother to use the entirely empty lane to my left told me this person was more than in a rush. He wanted to scare me. With his vehicle. Against my body. I rode on feeling vulnerable and wondering what it could have been that I did that made this person so angry at me. In the second incident, I was riding down Sharon Road from South Park toward town. There are two travel lanes until you get a Y where the two lanes veer left and you have to go into a left turn lane in order to stay straight. I looked back, no cars in sight, at least a half mile. Put my hand out and merged left. Looked back again, still nothing, moved into the middle of the turn lane. Suddenly a white sedan whooshed around me to my left, halfway out of the turn lane and cut back in, to avoid oncoming traffic at the light. As a bicycle accident lawyer in Charlotte, I deal with tragedies. Last week I took the deposition of a driver of a large truck who made the exact same maneuver, passing a bicyclist already in a turn lane, swerving back right to avoid oncoming traffic. The differences in that event were that the oncoming cars were closer, his car was bigger and he didn’t clear the woman on her bike who was in the turn lane turning left. He killed her. What this driver didn’t realize was that this woman on her bike was one of the most wonderful people you could ever meet. Everyone who knew her thought she was their best friend because that’s how she made them feel. The day she was killed she was riding her bike to raise money to help cure a disease that afflicted a friend’s family member. Helping others was not a part of her life, it was her life. Almost a year later, her husband, her daughters, her many grandkids and her entire community still can’t believe that this wonderful person is gone. So let’s not have the cyclist/driver debate again. We all know it and we all know the rules and despise those who break them. I start my recreational ride at 4:45 am and finish long before many people get up. I’m not obligated to stay out of the way, but when I’m on my road bike in spandex, I choose to do so. I stop at lights and stop signs and signal when changing position. So I don’t want to talk about being in the way or have a debate about whether I should be out there in the first place. What I want to talk about is the value of human life and how people can take it so lightly. I want to talk about the instant rage people feel when confronted with what could at most be considered an annoyance. Let’s talk about the complete intolerance of anything that stands in our way for even a fraction of a second. We don’t just see this on the road between bikes and cars; we see it in the grocery store on a busy Saturday, we see it waiting in line in the airport. People are angry and frustrated. No one is breathing. We’re all holding our breaths and trying to get to the next thing more quickly. In most areas of our lives, this anxious rushing has little consequence other than to make our lives rushed and anxious, and maybe annoy our families. On the road, however, it can kill someone. My whole life I have loved riding a bike. It’s always given me a sense of freedom to be able to get places by my own power, with nothing but the outdoors around me. Years ago I bought my first road bike and started group riding. That added more fitness, a social aspect and a sense of self-confidence and achievement to this activity that I already loved. I have a wonderful social network of good friends who also love being outdoors and being healthy and fit. But, now I am a mother and I have a little boy who needs me. I’m not the kind of person who’s intimidated into giving up something that’s important to me. I don’t typically shy away from a challenge. But the thought has crossed my mind that, by riding my bike on the road, especially alone, I am putting my life in the hands of people who don’t care about it and are willing to take pretty big risks with it. I’m not perfect by any means. I’ve been annoyed by people moving slowly at the grocery store when I’m trying to make a quick grocery run during lunch. Then every once in a while, a person will look back at me, offer a kind smile and apologize for being in the way; I become conscious of the realization that this isn’t an object in my way, this is a person, a nice person. I smile back. I relax. So if you’re a driver reading this and you see me on the road one day, please take a deep breath and give me some room. Most of the time it will be mere seconds, or even less, before you can pass me. Even if you don’t think I should be there, please don’t play games with my life. I’ll do my best to communicate with signals and use the road respectfully. Think about how you would feel if you hurt me and knew what it would do to my family. And if you happen to be one of those rare people who is simply just so angry and unhappy that life means nothing to you, I have some advice that might make you a little happier: go ride a bike. 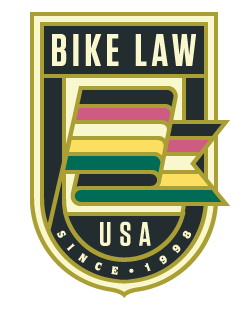 This article, Charlotte Bicycle Accident Lawyer on a Horrible Morning Ride, was originally published on Bike Law on May 29, 2014.